Current Page: Home > Tips > How to make iPhone ringtone longer than 40 seconds? How to make iPhone ringtone longer than 40 seconds? All ringtones in iTunes must be 40 seconds or less in length. For example, if your ringtone is 60 seconds long, it will not be recognized by iTunes as ringtone. Is there any way to break this limitation? 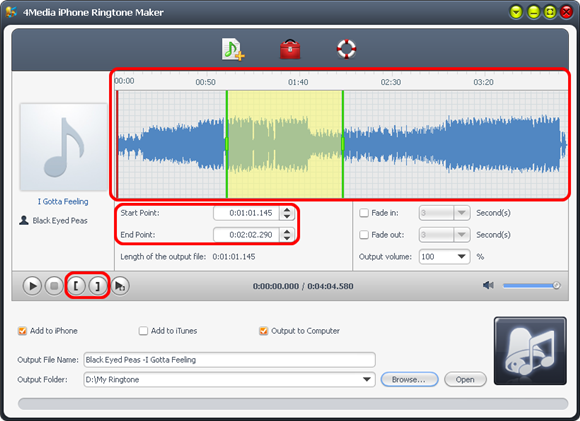 Now, the software 4Media iPhone Ringtone Maker can help you make iPhone ringtone longer than 40 seconds and transfer the ringtone to your iPhone directly. This guide will show you how to make ringtones step by step. Firstly, download, install and launch the software. Click the "Select file(s)" button on the toolbar to select the file you want to create ringtone in the dialog that pops up, then click "Open" button. You can see the audio waveform in the grid area. 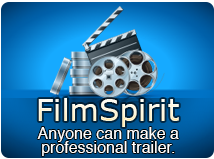 Click "Play" button to listen the music and find the part you want. 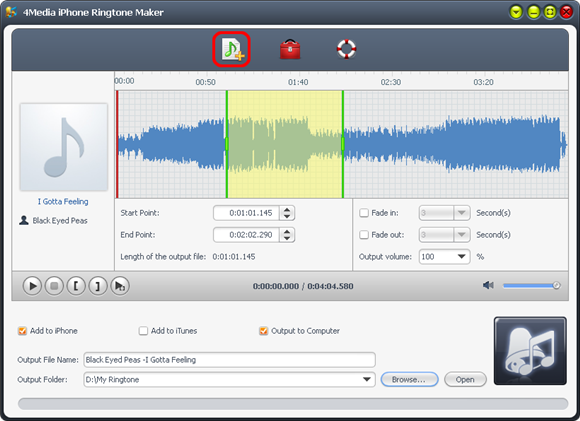 Drag and drop the start & end line to get a music clip, or click "Set the current time as the start point" and " Set the current time as the end point " buttons to extract a clip, or type the start & end time directly in the corresponding text boxes. The duration can be longer than 40 seconds. 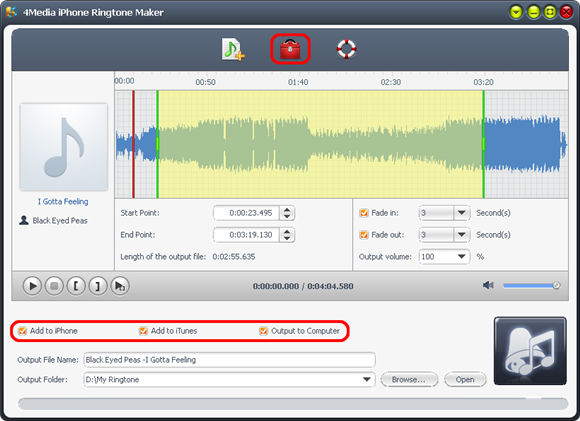 Enter the name in the "Output File Name" textbox or keep the original name, and click "Browse…" button on the right side of the "Output Folder" to choose a folder for saving the outputted ringtones. Tip: After making ringtone, you can click "Open" button to view the ringtone directly. If you want, check "Add to iTunes" and "Add to iPhone" options to let the program upload the ringtone to iTunes and your iPhone directly after conversion. 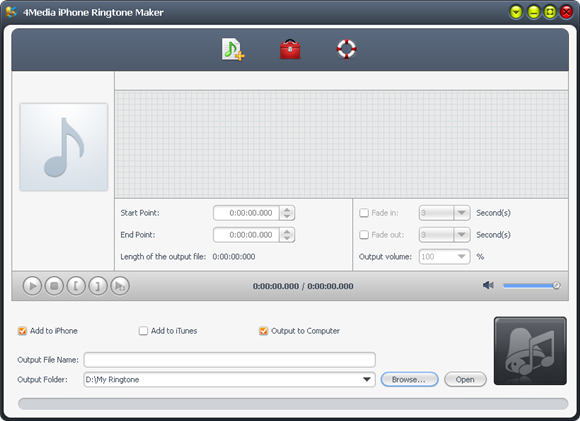 After all above are finished, click "Start Converting" button to start to make your own iPhone ringtone. You can check the converting process from the progress bar at the bottom. Just in a few minutes, you make your own iPhone ringtone from the loved music.